Mark, a qualified mechanical engineer,has been with the company since leaving school at 16. Now 'a few years older' he has a vast wealth of experience and is capable of the most exacting tasks the job might require. He is well versed with all the foibles of the classic and the modern day car and what he has forgotten about MGs most mechanics still don't know! Seven and a half years ago, Andy, a friend of Jon and Mark's, came round to provide holiday cover for two days and is still here! 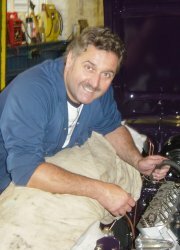 Andy is a very experienced mechanic and is also the stores manager and recovery driver for Entune 2000. 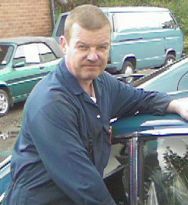 An international man of mystery (hence the picture) ex paratropper, MG owner, customer, and personal friend of Mark and Jon devotes several hours a week to help around the garage. 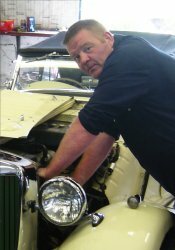 Code Name: "Dinger", a lover of the MG marque, has worked for MG international, and previously owned and managed his own garage.